Concession Stands can serve honey mustard with their chicken fingers and salads. If you are selling fried chicken at your concession stand, then honey mustard is a priority along with ranch dip and barbecue sauce. The restaurant supply superstore has the widest selection of honey mustard packets and bulk honey mustard for ballgames and concerts food booths. 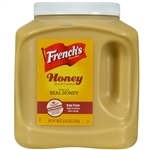 Frenchs Sweet and Tangy Honey Mustard - 105 Oz. 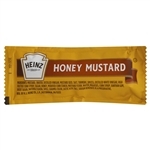 Heinz Honey Mustard Dip Cup - 2 Oz. Portion Pac Chatsworth Honey Mustard Sauce Cups - 1 Oz. Portion Pac Taste Pleasers Gourmet Dijonnaise Honey Mustard Sauce Cup 1 Oz. Precision Foods Foothill Farms Thousand Island Honey Mustard Mix 4 Oz. T W Garner Texas Pete Honey Mustard Sauce - 1 Gal. Unilever Best Foods Hellmans Easy Pour Honey Mustard Salad Dressing 32 Oz. Hellmanns Honey Mustard - 1.5 Oz. Make sure your patrons have easy access to honey mustard packets in your concession stand for their chicken fingers and salads.